Author Caitie Dunnington poses with her dog, Benson, during a book reading at the Columbia City Community Library on Saturday, Dec. 1. 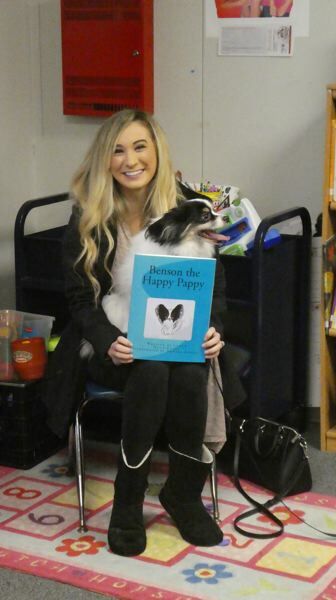 Dunnington, a St. Helens High School alumna, recently published a children's book called "Benson the Happy Pappy," and read the book aloud at an open house earlier this month. The book was illustrated by Damara Amaral, who is also a St. Helens High School alumna. The Columbia County Community Library is open Monday through Thursday from 3 to 6 p.m. and Saturdays from 10 a.m. to 2 p.m. and is free to use for all Columbia County residents. The library hosts special events and monthly craft sessions for children as well. The library is located at 2000 2nd St., Columbia City.